I Know HTML | Flickr - Photo Sharing! Cameraphone fun w/ my new Nokia 6270 from Italia. poopoorama, erisfree, the ryan king, and 285 other people added this photo to their favorites. funny!! 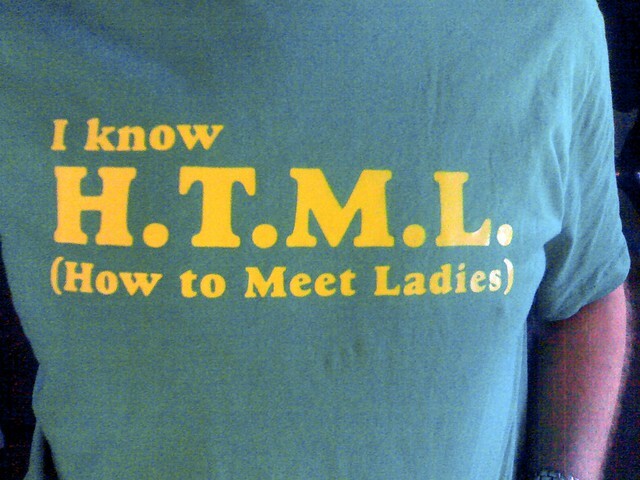 it could work also for girls; in their case HTML would be "how to meet LADS" !! that's funny!! how can i get this shirt! This is worthy of the Master Sword of Greatness! You must add your picture to the Master Sword of Greatness grou! Hi, I'm an admin for a group called Totally Boss!, and we'd love to have this added to the group! Hi, I'm an admin for a group called HTML Me!, and we'd love to have this added to the group!